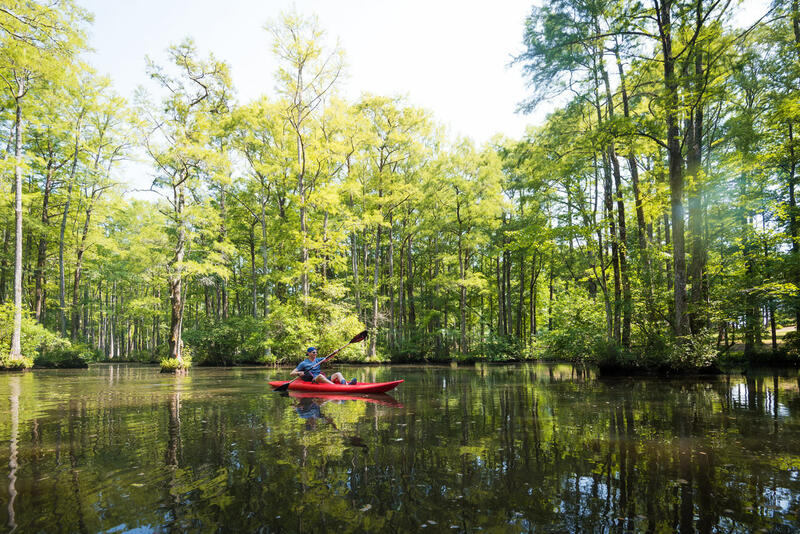 Located just east of Raleigh in the town of Wendell, Robertson Millpond Preserve is a hidden 85-acre refuge for nature lovers, canoeists and kayakers. Opened to the public in 2015, the blackwater swamp property is the only bald cypress habitat in the Raleigh area, creating the unique experience of paddling through a forest-like setting. Open on weekends and some holidays, the preserve's 1.15-mile loop paddling trail (marked by more than 70 buoys) is the main draw for canoists and kayakers. On Saturdays from April-Oct., Paddle Creek, a private rental and guide company, has solo and tandem kayaks available for hourly rentals. A parking and launch area allows you to bring your own canoe or kayak as well for no fee.